Sharing content to social networks typically happens in one of two ways: by clicking a social sharing button found on many blogs and websites, or by using a social media management platform such as HootSuite. Buffer, a new social sharing application, combines both of these functions. 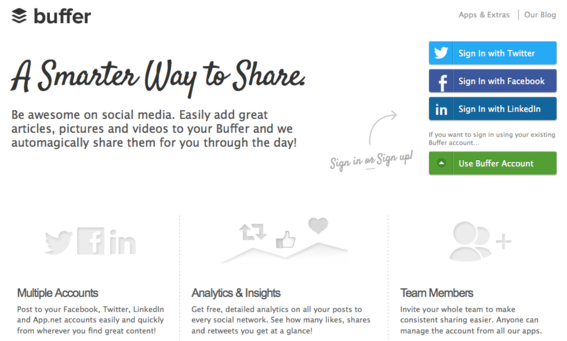 Buffer provides a variety of ways to share content on social networks. Buffer places content shared by its users into a queue. The application then publishes it at specific times throughout the day when its algorithm determines the content will receive the most views and engagement. 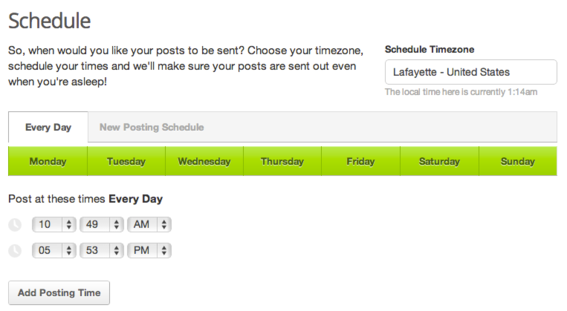 Users can also schedule the times they want posts to be published for each profile. Registered users can post in different ways: via the Buffer website, through browser extensions on Chrome, Firefox, and Safari, or using the Buffer social sharing button, which can be embedded on websites. Mobile versions of the app are also available for iOS and Android. The app allows posting to Facebook, Twitter, LinkedIn, and App.net. In addition, the button integrates with a number of other applications such as Feedly, Instapaper, Bottlenose, Twitter, and WordPress. Buffer also includes its own analytics component so users can see Likes, shares, and retweets. Buffer acts as a “lightweight” social media management application in that it does not contain all the functionality as platforms like HootSuite or Sprout Social. The key benefits are its ease of use and the timesaving convenience it provides, which is based on the different ways content can be shared. For example, rather than copying a URL, then going to a social media management platform to create and schedule a post, users can simply click the Buffer button found on the page and add it directly. Here are some options for using the Buffer website to create and schedule posts. Connect your social profiles. Once you have registered on the site, the first step is to connect your social profiles. This lets Buffer know where to send your posts. Users must first connect their social profiles. Schedule posting times. 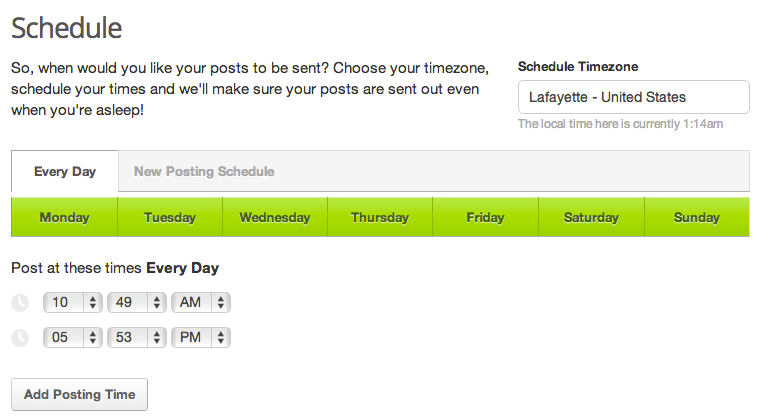 Go to the “Schedule” tab to select the days and times that you want posts to be published for each of your profiles. Users can schedule posting dates and times for each social profile. Create posts. Click the “What do you want to share?” box at the top of the page to add a post, which can be done either by typing or pasting content such as text and URLs. Photos can also be uploaded from your computer. Buffer enables posting directly from its admin dashboard. Once you have entered content, click the social network icons to choose the profiles where you want posts to be shared. Posts that have been added will appear under the “Buffer” tab for each profile selected. View analytics. Buffer keeps a record of engagement for each post that includes comments, Likes, and reshares. It also predicts the number of people who could potentially see the posts. The analytics features shows comments, likes and shares. Where Buffer is different from other social media management applications is through the use of a social sharing button that can be added to any page on a website or blog. The social sharing button can be added to any webpage or blog. You can choose the button style, text, and a Twitter account to mention in posts, then copy and paste the HTML code where you want the button to appear. WordPress users can bypass the setup process by using a plugin provided by Buffer. Site visitors simply click the button to share content. They must first sign in using Facebook, Twitter, LinkedIn, or their own Buffer account. Unlike other social sharing buttons, the application gives them the option to post immediately or schedule publishing for a later time. Clicking the button opens a window where users can schedule posts or share immediately. Buffer is free to use. A premium version is $10 per month. It enables users to post to up to 12 social network profiles. Free users are limited to four.